This Irish crystal bowl from Galway is a retired piece that is limited to stock on hand. 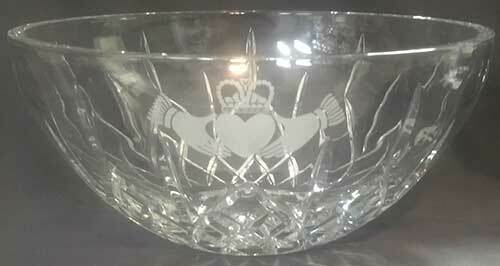 This Irish crystal bowl features an etched Claddagh icon along with a cut motif. 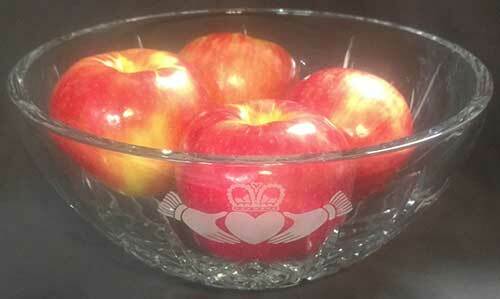 The Claddagh bowl is a large design that measures 5" tall and is 11" wide at the rim. The Galway Crystal bowl is made of 24% leaded crystal; it is gift boxed with a Claddagh history card, complements of The Irish Gift House.